The Chairman of Sri Lanka’s three-member probe commission says that certain isolated incidents that may have occurred outside the activities of the war should be investigated in depth to come to conclusion. He said that whether to permit foreign involvement in the mechanism, more than observing, is a political decision. “Those are political decisions we never wanted to tread,” Maxwell Paranagama told Ada Derana in an interview. The Commission of Inquiry that probed Abductions and Disappearances (better known as the Maxwell Paranagama Commission) has found that it was the LTTE which killed majority of Tamil civilians during the last 12 hours of the final stage of the war, according to the commission report tabled in Parliament yesterday. Prime Minister Ranil Wickremesinghe tabled the Maxwell Paranagama Commission report and the Udalagama Commission report along with the UNHRC report on alleged human rights violations in Sri Lanka. The opposition, meanwhile, seems to lack a coherent and focused plan of action. Their strategy appears to consist mainly of various efforts at informing the public that the predicament Sri Lanka faces at present is really bad (i.e. similar to 1815 or worse) which is all true, but hardly useful if what one wants is a practical way to address the said predicament. One should be rather wary of taking on Mr. Izeth Hussein because he claims to be one the five great diplomats of the world. With such self-proclaimed credentials – he has yet to name the other four greats which will indicate the true measure of his greatness! 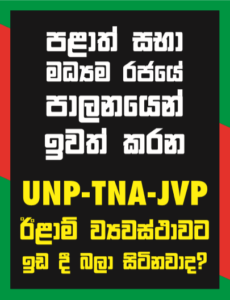 – one expects his justification for Siri-Wicky regime’s co-sponsorship of the latest UNHRC Resolution, (see Colombo Telegraph – 10/10), to be a solid counterweight to silence the rising opposition to it. But all what he has done is to add the concept of “sovereignty” to his list of harams. Earlier he said haram to President Mahinda Rajapaksa kissing the tarmac when he alighted from his plane at Katunayake airport, celebrating the victory over the Tamil Tiger terrorists. He said kissing the tarmac (an imported product) was haram. Instead he wanted Rajapaksa do what the Caliph who conquered Constantinople did : bathe in sand.